No matter if it’s financial advice, business advice, career advice or whatever information you pick up from listening to “The Raja Show”, the ultimate goal is to help you achieve your personal success. But If you ask Raja, or any other person you may deem to be “successful” in these regards, they’ll tell you that TRUE success lies much deeper than having much personal wealth, starting and growing a thriving business, or getting that dream job. While those are nice goals to work towards, TRUE success often lies with the impact you make on others. This was no more evident than at this past Wednesday’s “Night of Inspiration” event, presented by CCChampions, an organization devoted to forging lasting long-term relationships between children who are battling cancer, and the pillars of the community, be they athletes, entertainers, police and firefighters (among others), who these children look to for inspiration. At the “Night of Inspiration”, Raja himself presented an “Inspiration Award” to both the kids and their mentors. While these presentations were very special for the kids, and their families, as well as their inspirational mentors, and others in attendance that night, theirs are stories that Raja felt needed to be shared on a bigger stage, like a radio show. 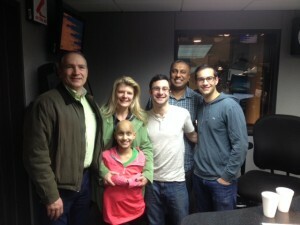 HIS radio show. On this edition of “The Raja Show”, we take an in-depth look at two of the stories of inspiration facilitated by the charitable efforts of CCChampions. Raja welcomes two of the children that were featured that evening, and we will hear from the local figures who these kids look up to for inspiration, as well as Sidney Kushner, the Founder and Executive Director of CCChampions, whose vision and inspiration, coupled with his drive and determination to put his idea to work, were the catalysts behind this wonderful organization. 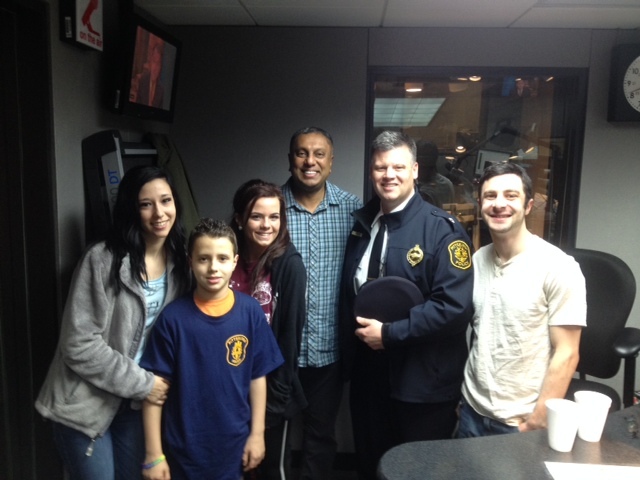 First, Raja talks with nine-year-old cancer survivor Connor (second from left, flanked by members of his family), about his story, and his lifelong desire to be a police officer. 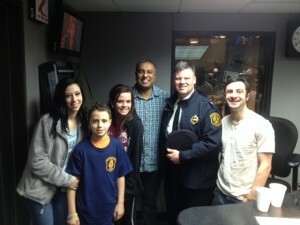 When Sidney (far right) heard that story, he set the ball in motion to pair Connor with Officer Scott Schubert (second from right), the Assistant Chief of Police for the City of Pittsburgh. Scott discussed his relationship with Connor, and the importance to all public servants of establishing themselves as positive, accessible role models in the community, so that Connor and other members of his and future generations have people who inspire them and people they can turn to for guidance and support. Next, Raja spoke with Anya (second from left, flanked by her parents), a cancer patient who is also nine-years old, as well as Sidney and Brian Baum (far right), author of the successful book, “Profiles in Success,” and its newly-released sequel, “Profiles of Success 2″. Anya talked about her many activities and interests, including her love for baseball and softball. And while the inspiration with whom she was matched, legendary Pittsburgh Pirate catcher Manny Sanguillen, is out of town with the Pirates in Spring Training, Anya more than held up her end of the conversation. Plus, Brian, an ardent supporter of CCChampions, discussed how the ability to inspire, and be inspired by, others was the (pardon the pun) inspiration for his pair of books that shine the spotlight on what makes today’s leaders tick. If you tune into “The Raja Show” for Raja’s expert commentary on the current state of business and the economy, and what it all means for you, you’ll get plenty of that during his opening and closing monologues. But if you tune to be inspired by stories of people overcoming gargantuan challenges in order to succeed at any cost, this show is DEFINITELY one you cannot miss!